The Montgomery Symphony Association is pleased to announce the 25th annual Stringfellows Music Camp. StringFellows is a preparatory program for rising 7th – 9th grade students of violin, viola, cello and bass. This one week residential music camp focuses on building the musical skills necessary for success combined with the fun and friendship of a great summer camp. Participants should be rising 7th – 9th graders, be able to read music and play two-octave scales in several keys. Experience in the positions is helpful but not necessary. All campers will play for the faculty at registration and complete a theory background sheet to help determine the content of classes and the repertoire for the orchestra. Campers must be recommended by their string teacher to be considered for acceptance into StringFellows. Click here for recommendation form. The total cost for StringFellows summer session is $350. * This fee includes registration, tuition, room, board, and music fees, as well as scheduled group social activities and a camp T-shirt. 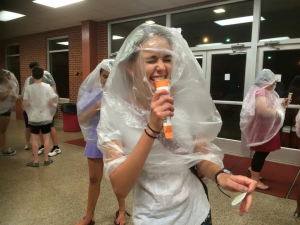 Campers will be housed in the Huntingdon College dormitories and will eat in the College Dining Hall. Registration Deadline is May 17, 2019. Scholarships ranging from $50 – $200 are available to StringFellows and will be based on financial need and instrumentation requirements. The deadline to apply for a scholarship is May 5, 2019. Click here for Teacher Recommendation form. The faculty of the StringFellows are selected from the state’s most respected teachers. Each one is dedicated to helping young string players advance on their instrument and joins us with many years of successful teaching experience. 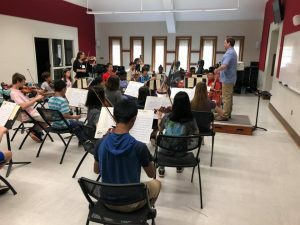 Camp activities include daily string orchestra rehearsal, music history and theory classes, and a full range of social opportunities, both on and off campus, will be offered daily. The Cameron Award and The Holmes Award: Two full scholarships for 2020 StringFellows will be presented to the most improved 2019 StringFellows male and female campers. The Wilkerson Award: Recognizes the most improved rising 9th grade participant and provides a cash award of $300 to support future music expenses. The Campbell Award: A full scholarship for 2020 StringFellows will be presented at All-State to the most improved member of the Sinfonia Orchestra. For further information, contact us at 334-240-4004 or montgomerysymphony@gmail.com. *The MSO reserves the right to use photos from all education programs and images of registered participants for the organization’s use in program materials, education promotions and website use. By participation in the program the participant and guardian acknowledge this policy.